Like I said before, due to this issue on my hands now, it became necessary for me to seek your assistance, I appreciate the fact that you are ready to assist me in executing this project, and also you will help me in investing my money in your country, I am quite certain about that. You should not have anything to worry about, I will do everything legally required to ensure that the project goes smoothly, it shall pass through all Laws of International Banking, you have my word. trust to see this through. I know we have not met before, but I am very confident that we will be able to establish the necessary trust that we need to execute this project. I am now finding a foreign bank, I also prefer we use HSBC BANK IN the UK, I now intend that you open an account in your name in this foreign bank. The money would be transferred to your account which you will open in the bank for both of us, this is the best way, I have found; it will protect us from my bank. I want us to enjoy this money in peace when we conclude, so you should listen to my instructions and follow them religiously. Also you have to know that I cannot transfer this money in my name, as my bank will be aware that it is from me, this is where I need you. As result of this, you will have to open an account in the corresponding bank. I will obtain a certificate of deposit from this My bank, it will be issued in your name, this will make you the bonafide owner of the funds. After this, the money will be banked for both of us. We can then instruct the bank to transfer our various shares into our respective home bank accounts. I will also perfect the documentations with the assistance of my attorney to give the transaction the legal right. Before I commence, I will need you to send me a copy of any form your identification (Driver's license or International passport) I want to be sure that I am transacting with the correct person. As soon as I get these from you, I will commence the paper work. I hope you will understand why I need all these, the money in question is big and I want to ensure that I know you well before I proceed to give you all the details to commence the project. I will send the name and contact details of the bank and their website to you so that you can commence communication with them. Our local telephones lines could be intercepted easily, so they are not safe for the project. This is why I have installed a more private communication, which is through this email box. I will want us to estaliblish a code which both of us will always use when writing emails to each other. Please you can tell me what u want to be the code in your email. Ensure that you keep this project confidential, do not discuss it with anybody because of the confidential nature of this project and my work, Note that I intend to come to your country for the sharing as soon as this transaction is completed. 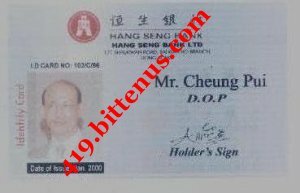 Note that my work ID and picture of my family is attached to this mail and I would like to invest part of my share in your country as soon as this transaction is over.